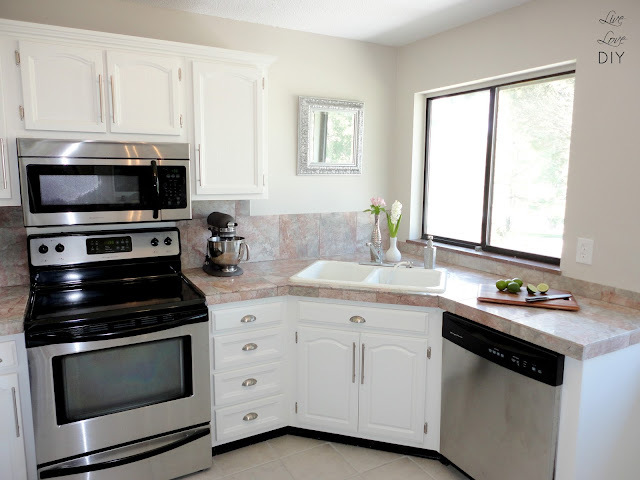 How on earth do I paint my cabinets??? Painting your cabinetry will take you some time, but it's a lot easier than you might think, and if I can do it, so can you. 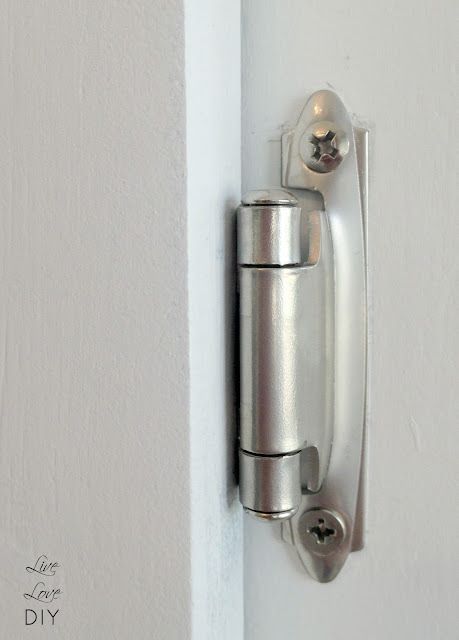 Before we get started, let me just show you just how great our new paint and hardware looks! 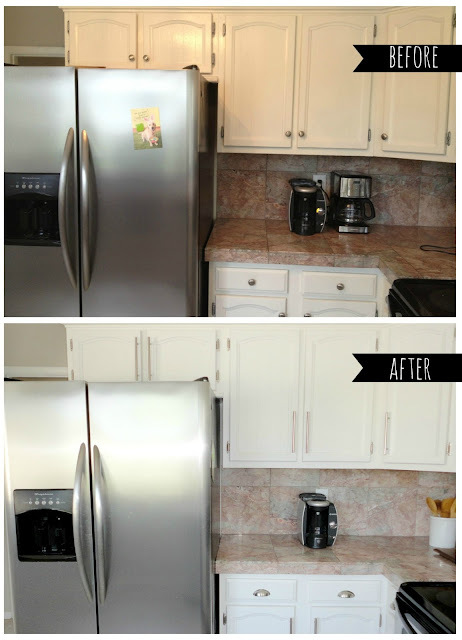 As you may remember from this post (where I painted the insides of my cabinets with chalkboard paint), I mentioned that I had just re-painted my cabinets. That was true. 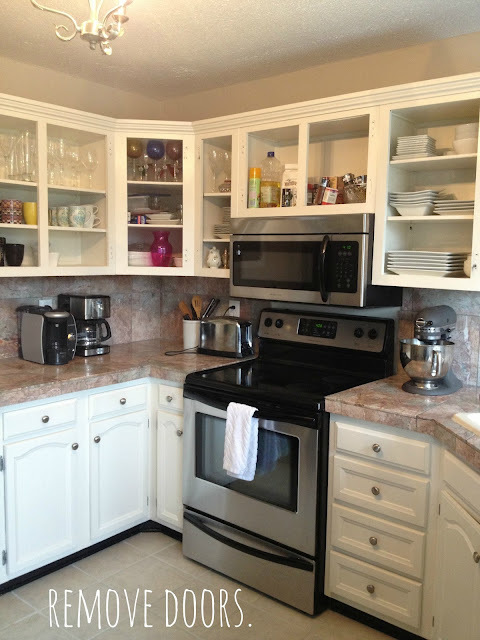 When we first moved into this house, the kitchen cabinets had already been painted. It was the worst paint job ever. EVAH. There were heavy brushstrokes everywhere and the spraypainted hinges and hardware were rusty and gross. It was a mess. It was not a good example of spray paint usage. And that's coming from a gal who is obsessed with spray paint. After painting all of the insides of my cabinets, I was just worn out. So, rather than paint the exteriors the correct way, I just slopped some more paint up over the old paint. I basically just made the horrible paint job from the previous owners worse. I completely ignored the kitchen cabinets for the next 6 months while I worked on other things in our little kitchen like the dirty grout and the gross tile countertop. 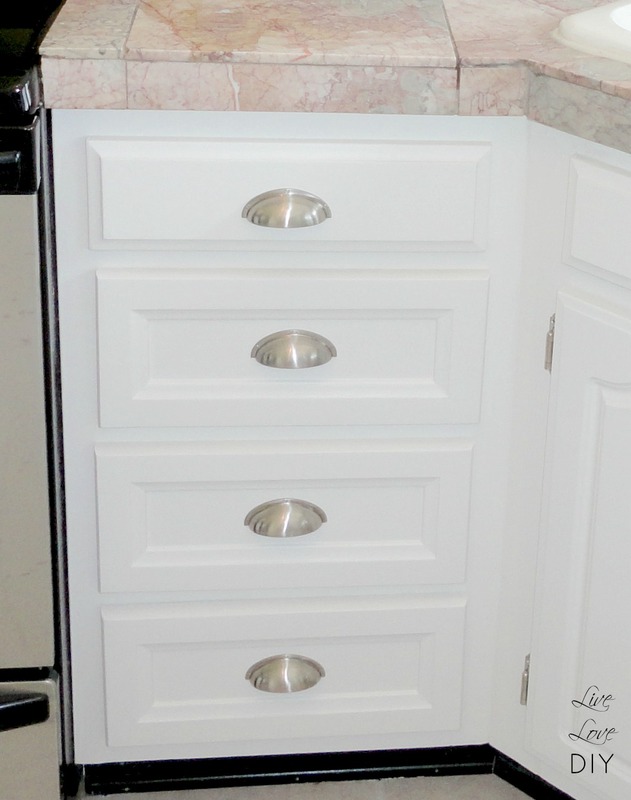 Then when I was feeling up to it again, I decided I was going to paint the cabinets the right way. I also decided that a great motivator would be to reward myself with brand new fancy hardware for the cabinets when I was done. 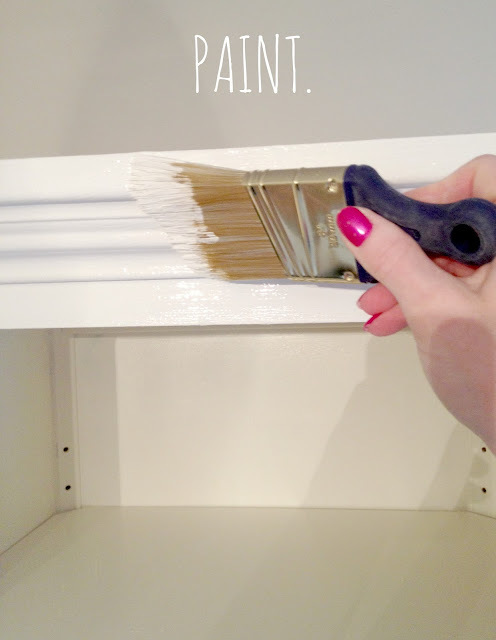 So, you may be asking...but, Virginia, my cabinets aren't painted. They're just wood. How does this help me? 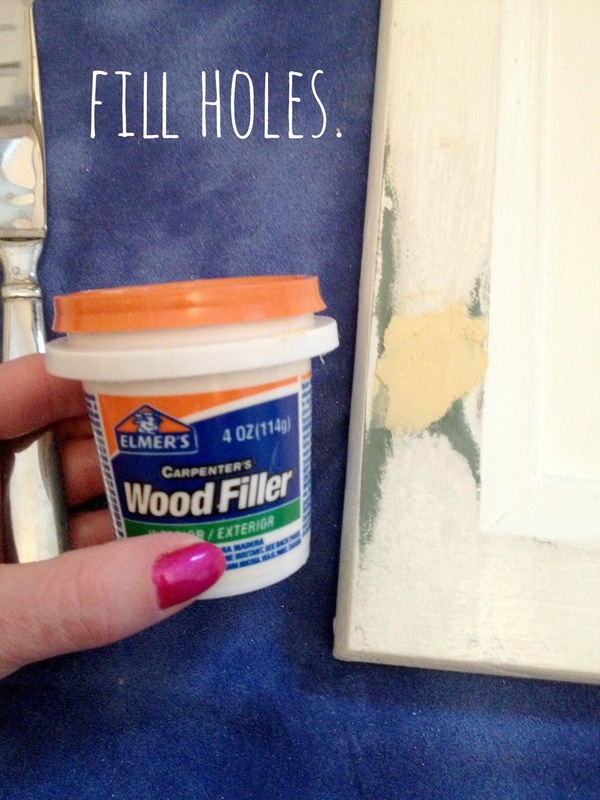 Well, because after painting countless pieces of old furniture, I can promise you that the process is very similar whether you are painting over old paint or old wood. 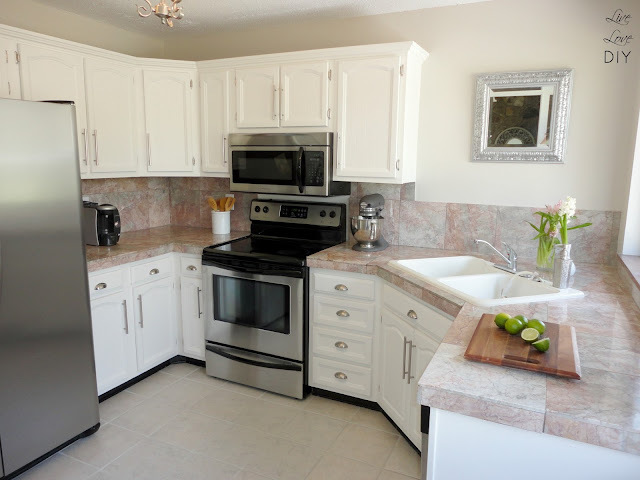 And I will coach you through the process of painting your cabinets, whether you have cabinets that are covered in paint or just normal wood. Promise. I've narrowed my tutorial down to 10 easy steps. 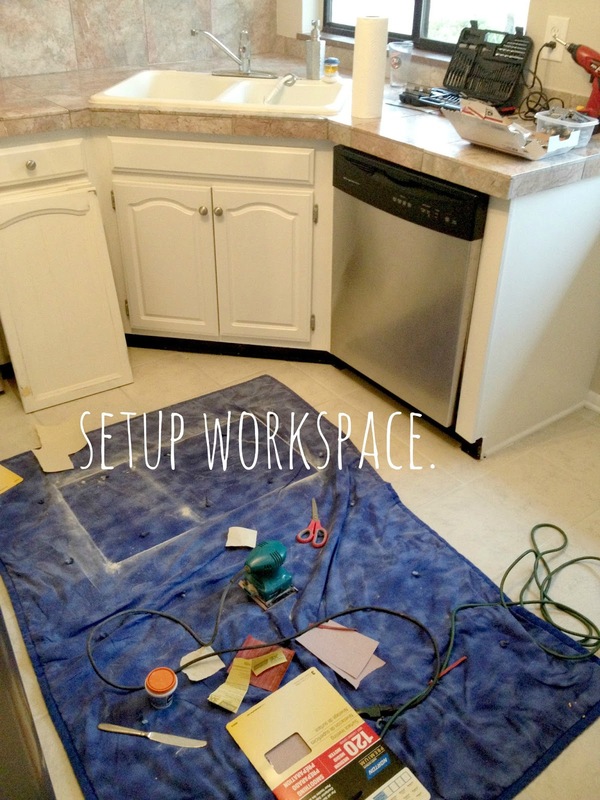 Step #1: Assemble your supplies and set up a workstation. 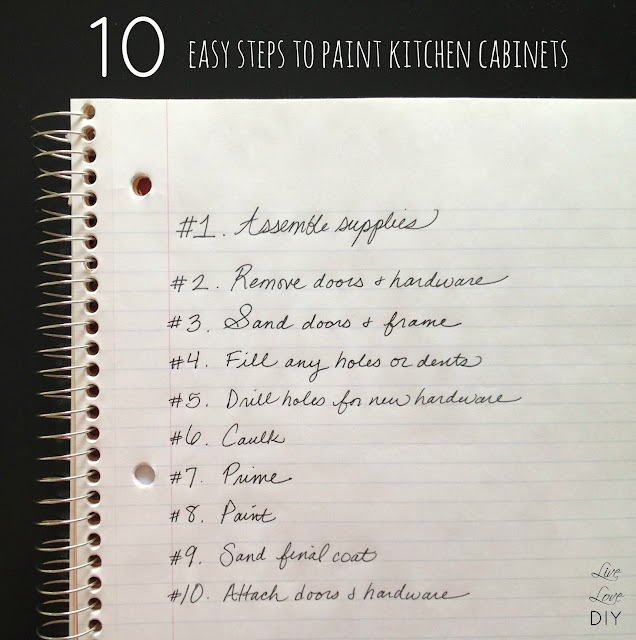 You really don't need much to paint your cabinets. I've seen tons of tutorials that talk about paint thinners and paint sprayers, and they're great. BUT, if you're just a normal person like me who doesn't own expensive equipment, meanwhile trying to not break the bank, but still wanting a great result while doing it yourself, then you can take a much simpler approach. *All above links take you to my Amazon affiliate store. Also, set up a workspace. I did all of this right on my kitchen floor. I just laid out my favorite blanket that I always sit on while I work (it's comfy and washable) and got to it. You'll probably wanna use a dropcloth, but I'm just a weirdo who enjoys her hiney cushioned while she works. Also, make sure all your stuff (food, dishes, etc.) is out of the way so that you don't get dust in everything. Feel free to peruse your eyeballs over that. I realize it's a true delight for the senses. #2. 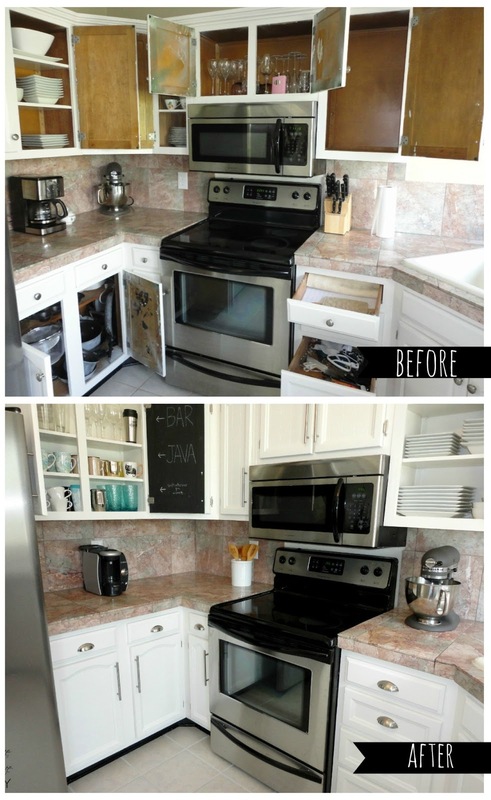 Remove all of the cabinet doors & hardware. 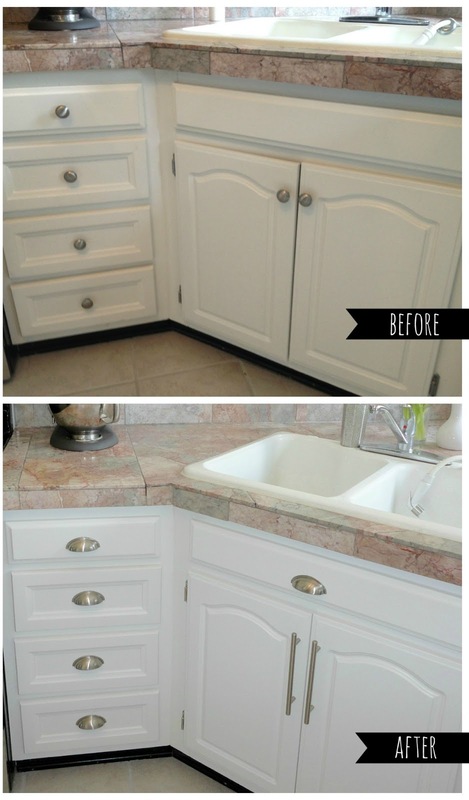 Take all of the doors off the cabinet frame, take the drawers out, and remove all of the hinges and hardware from the doors. That pic was snapped about halfway through the removal process. I didn't need to worry about labeling the doors so that I wouldn't get them confused after I took them off. A good tip (for those of you without a crazy chalkboard obsession) is to put a little piece of masking tape on the back of your cabinets that reminds you where they go. #3. Sand Door & Frame. This is an important step in the cabinet painting process. It's also the step that makes this tutorial apply to most everyone, regardless of your current cabinet situation. Whether you have layers of goopy old paint on your cabinets or if you just have some sort of polyurethane finish (the shiny stuff) over your wood surface, sanding is what you use to remove it and prep the surface for paint. You could also use thinners and other harsh chemicals, but I really hate that stuff and prefer to sand. I think it's a lot easier, and when you use that stuff you still have to sand when you're done. I use 2 types of sandpaper for this step. A high/medium grit (depending on how much gunk you need to remove, get a high grit for lots of goop or a medium grit for medium goop) and a fine grit. Start with the high/medium grit and just sand everything off. I used a junky electric sander to get the large surfaces and then just got in the little crevices and corners by hand. Once you've gotten most of the goop off, sand them with a finer grit sandpaper to get rid of any splinters or really rough spots. NOTE: You shouldn't have to completely remove your paint or clear coat. 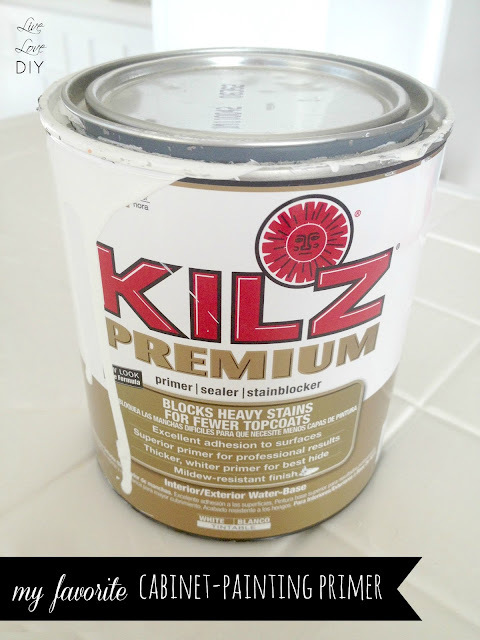 The goal is to have a fairly raw surface for your new coat of paint to adhere to. 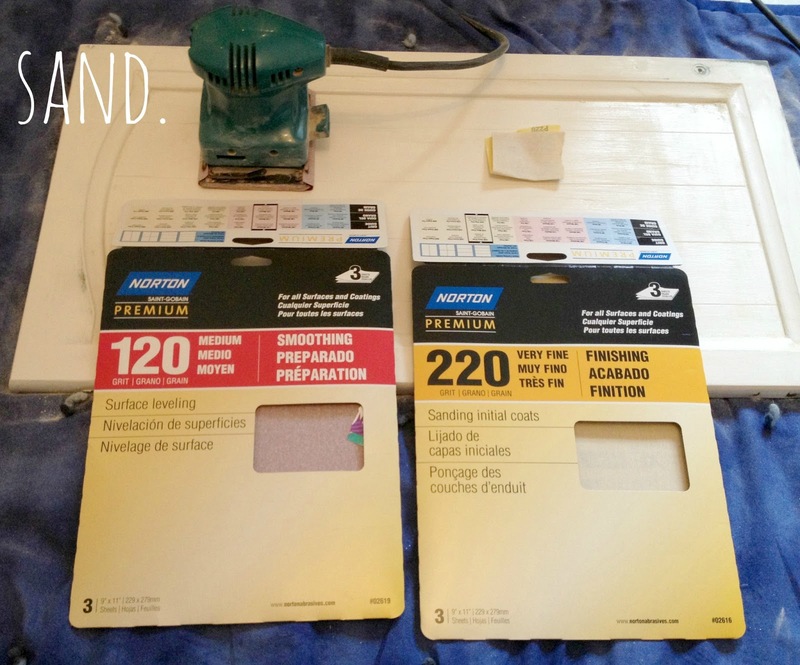 All of this sanding will make your paint adhere better and will give it a nice smooth finish. I used Elmer's wood filler to fill in the holes where the old hardware was attached because I wanted my new hardware higher up. You'll also want to use wood filler on any dings, dents, and scratches. Apply a small amount, level it off (I'm basically a caveman and just used a butter knife), and let it dry for an hour or so. 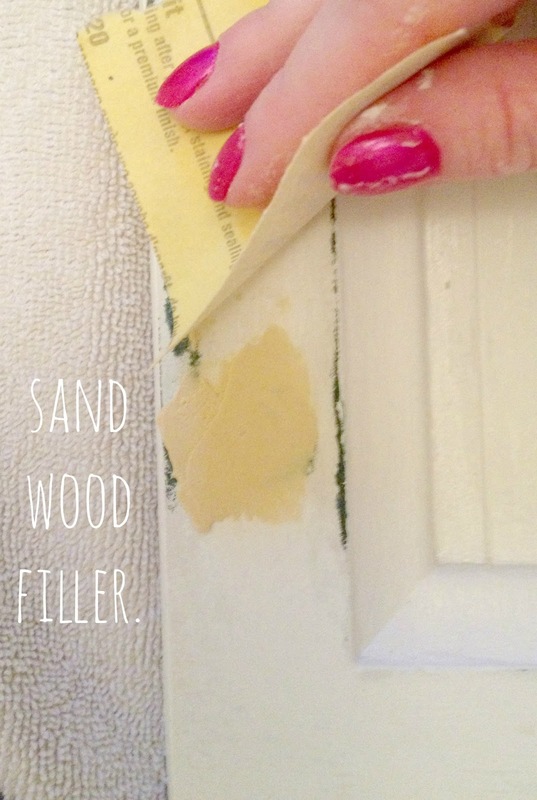 Once the wood filler is completely dry, sand it down level to the surface with a fine grit sandpaper. #5. If needed, drill necessary holes for your new hardware. Funny story....I was a total weakling and no matter how hard I pushed, I couldn't get the dang drill through the wood. Jesse actually drilled all of the holes for the new hardware. I made him take a pic of me pretending to be the best driller on the planet, and because it's so ridiculous and makes me laugh....I'll divulge my shameful secret. I called Jesse at work, moody and frustrated telling him how I just couldn't figure out the dang drill. He came home, tried it, and did it in about 2 seconds. But, then began laughing and admitted that the drill bit was pretty much worthless and as dull as a watermelon. And then to punish him for owning a worthless drill bit, I made him take my picture. Because boys hate taking pictures. Caulk is such a magical little substance. I used it all over the place on these junky old cabinets. 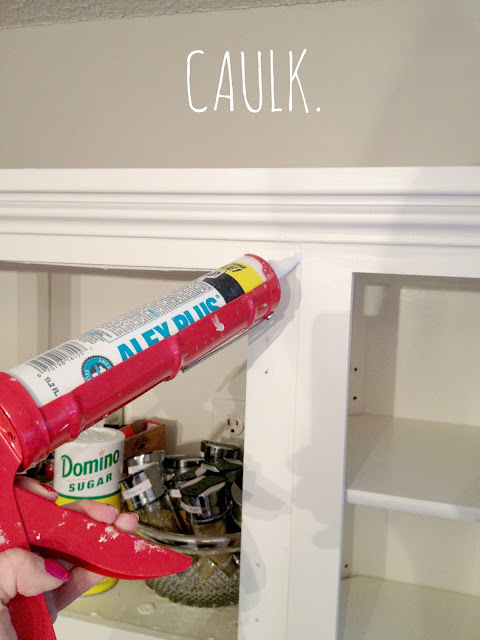 Before you paint, caulk between every gap or seam you can find. It will give you the absolute best end result because it makes everything look totally seamless and perfect. Priming your cabinets is really important when it comes to the durability of your paint job. Whether you have unpainted cabinets or already painted cabinets, this will cover up any stains, make your new paint adhere like superglue, and give you a durable result. Prime everything...doors, drawers, and cabinet frame. Make sure you follow the exact same steps while priming that I'm about to show you below in step #8. Both your primer and your paint should be applied the same exact way. But, as far as the order goes...prime first, let dry, then paint. 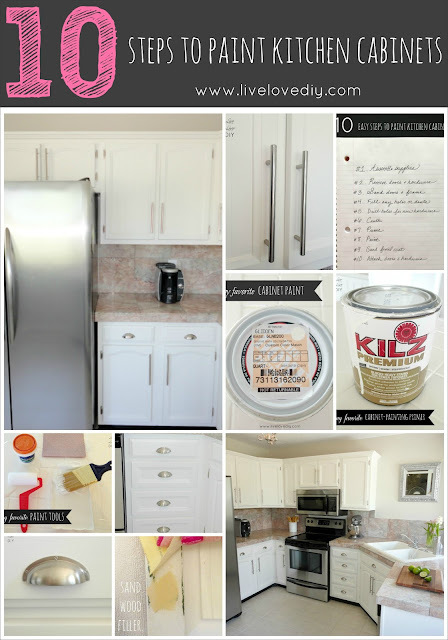 My favorite paint for cabinetry is called Silky White. 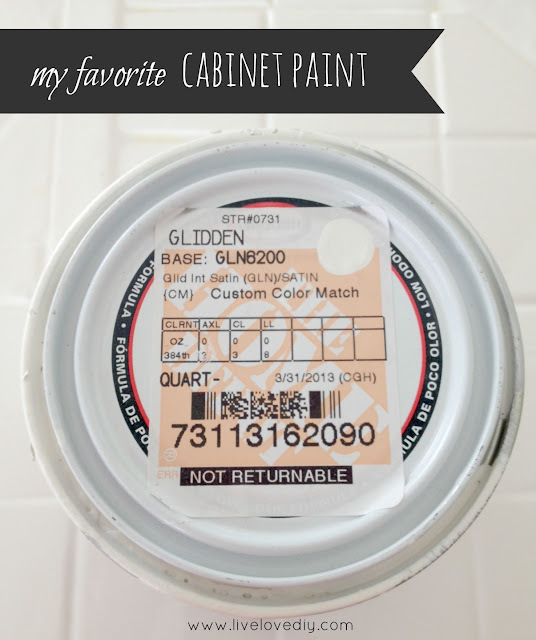 It's actually Behr Silky White, but I get it mixed in Glidden because it's cheaper. In my experience, for $5 less per quart, there is not a very noticeable difference. And I like saving dollars. I was able to do all of my cabinetry with 2 quarts of paint. If you've primed your cabinets, your paint should cover pretty easily. I only needed 2 coats of paint on everything. Now, this is an important part of step #8. 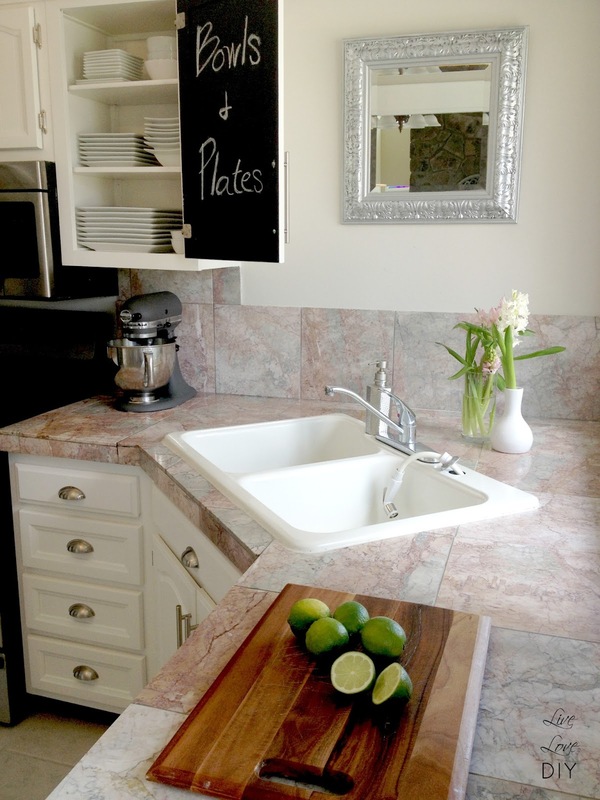 How you apply your paint is super important in determining how your finished result will look. You want it to look professional, and without any brushstrokes. Most pros use a paint sprayer to accomplish this. But, if you're like me and don't own fancy equipment, you can achieve a brushstroke-free finish without one. You'll need 2 things, an angled paintbrush (The one I recommended in the supply list is a lifesaver on this project) and a mini foam roller. Working in small sections, brush on your paint with the angled paintbrush. 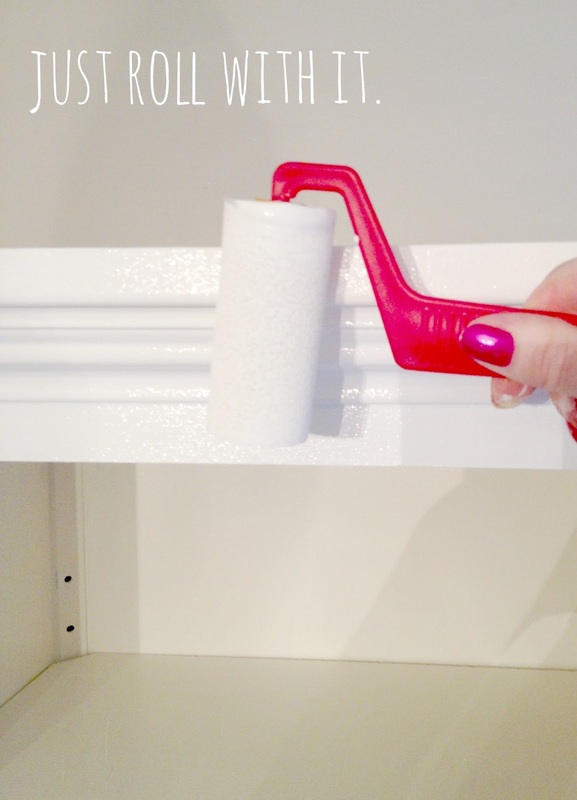 And while the paint is still super wet, go back over all your paint, pressing lightly with your mini foam roller. It's like magic. I find these little guys at Home Depot for less than $2. 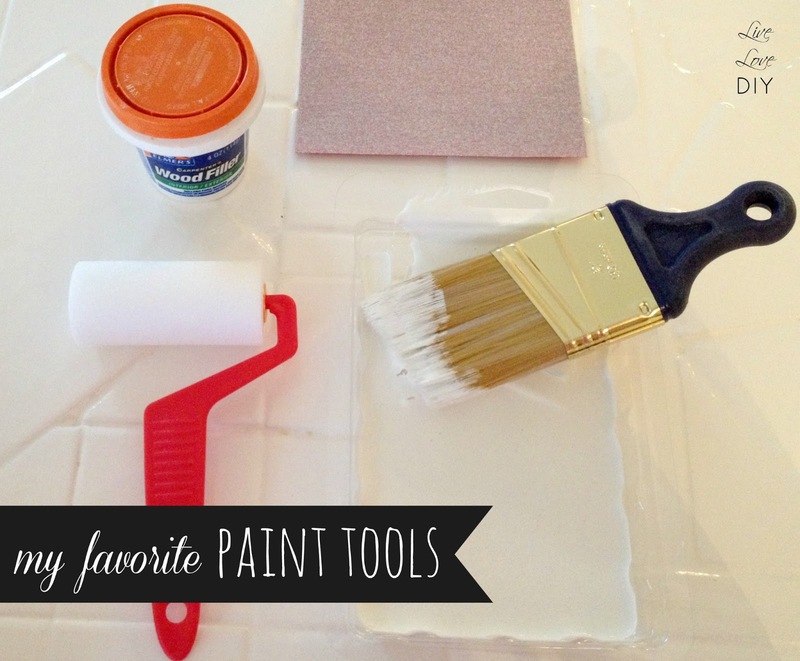 I use them on everything...cabinetry, trim, furniture. Love 'em. Just remember to work in small sections, going over your brushstrokes as you go with the foam roller. It will provide you with a flawless finish. 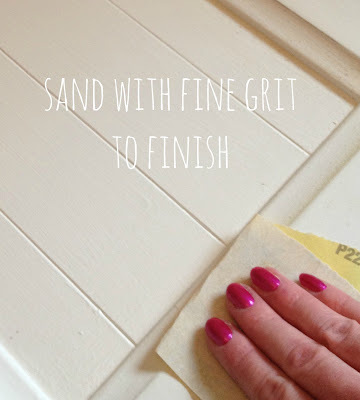 Once you've painted your two coats and allowed them to dry overnight, use a really fine grit sandpaper to give everything a really light final sanding. Get the finest grit you can find...the sandpaper package should say something like 'final finish' on it. After you've sanded the final coat of paint, if you want your finish to last a long time, I recommend coating with a satin polycrylic. This is the final step, and my absolute favorite out of all the steps. It's time to put the doors back on the frame and attach the new hardware! 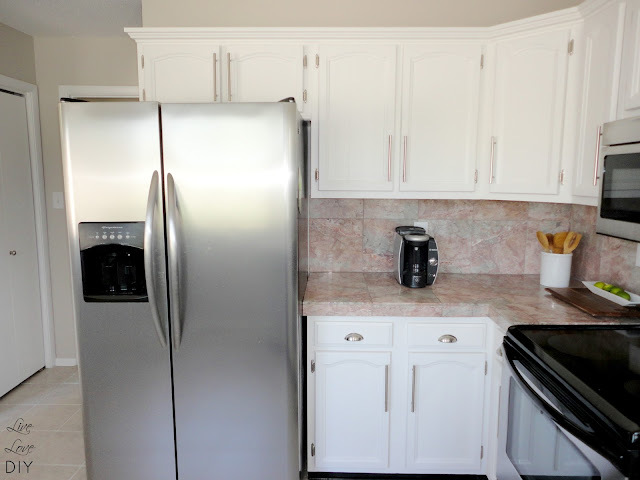 After spending a good few days on finally painting the cabinets the right way, putting brand new hardware on them was like the pot of gold at the end of a really labor-intensive-rainbow. 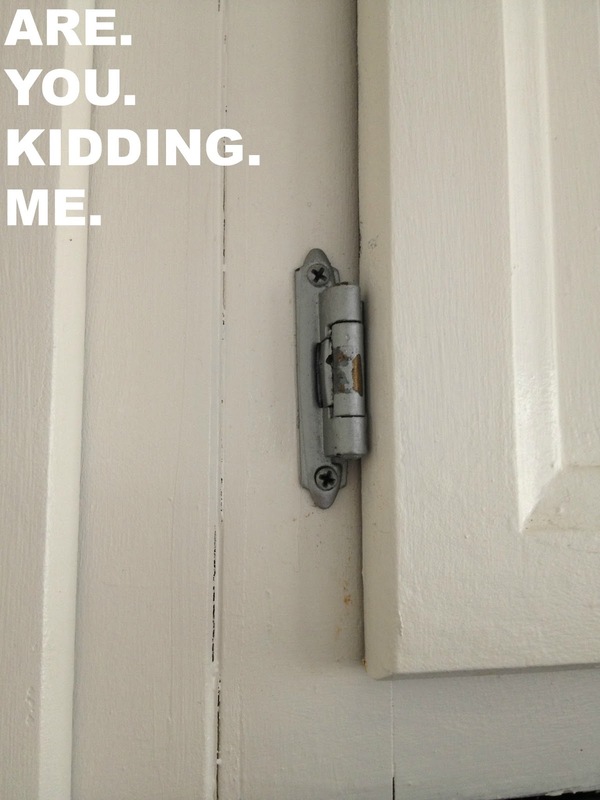 Ever since we moved into this house 3 years ago, I've been hoping to upgrade our kitchen with nice high-end hardware. It's like jewelry for cabinets....and frankly, I am a true jewelry luvah. I looked all over the place trying to find affordable, high-quality options and there were very few. And then I came across D. Lawless hardware. Not only did they have all of the high-end hardware styles that I get all googly-eyed over, but their prices were absolutely amazing. I was so blessed to contact them and have them offer to furnish our kitchen with new hardware, but even if they hadn't, I honestly think I would have shopped there anyways. 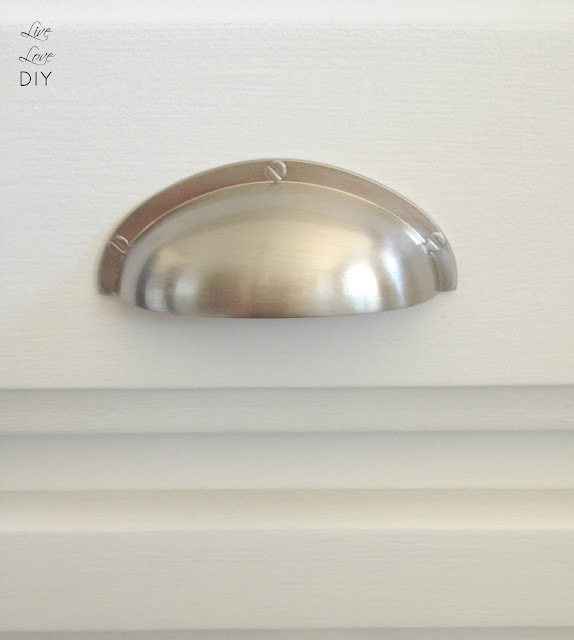 For all of our drawers, I chose a classic satin nickel cup pull. and for all of the cabinets, I chose a classic Stainless Steel Bar Pull. Can you believe D. Lawless Hardware sells these for about $2 each? (Use code 'livelove' to save 10% on your hardware purchase at D. Lawless Hardware.) 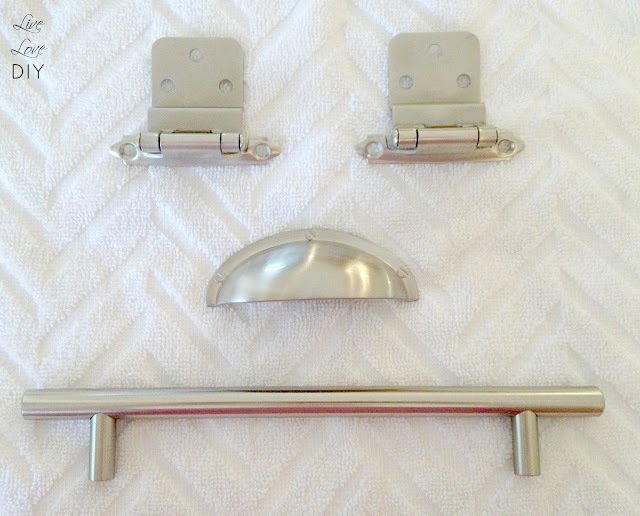 I've been obsessed with these super long bar pulls forever, and seeing them in my own kitchen totally makes me do a little hammer dance. 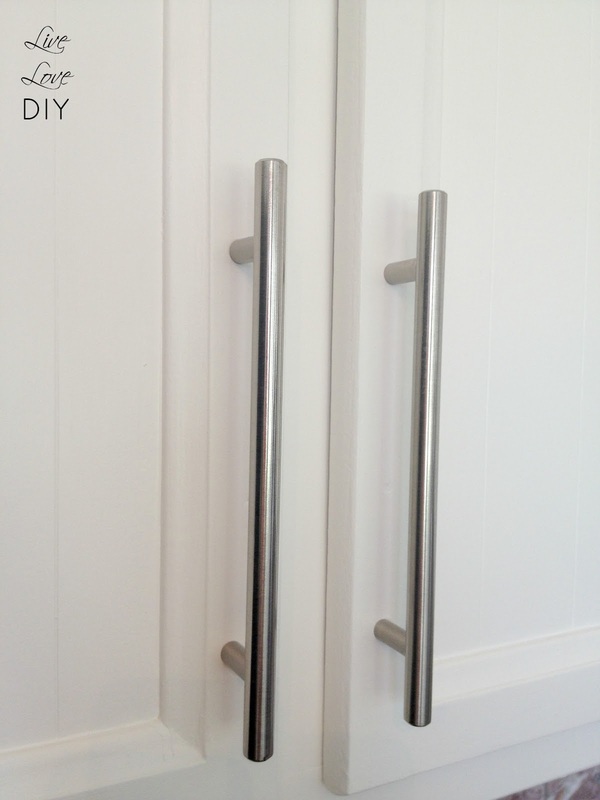 To replace our awful, goopy, cringe-worthy spray paint hinges, I chose the Satin Nickel hinges. Never in my wildest dream would I have thought that I would ever be so happy over a little hinge. But when you see the crazy difference it made, maybe you'll understand my hinge-glow. Also, this is a perfect before/after picture for you to see how drastic the difference is between the awful paint and my new good paint. Painting things the right way makes a massive difference. Now, it's time to check out the difference all of this hard work made in the kitchen. 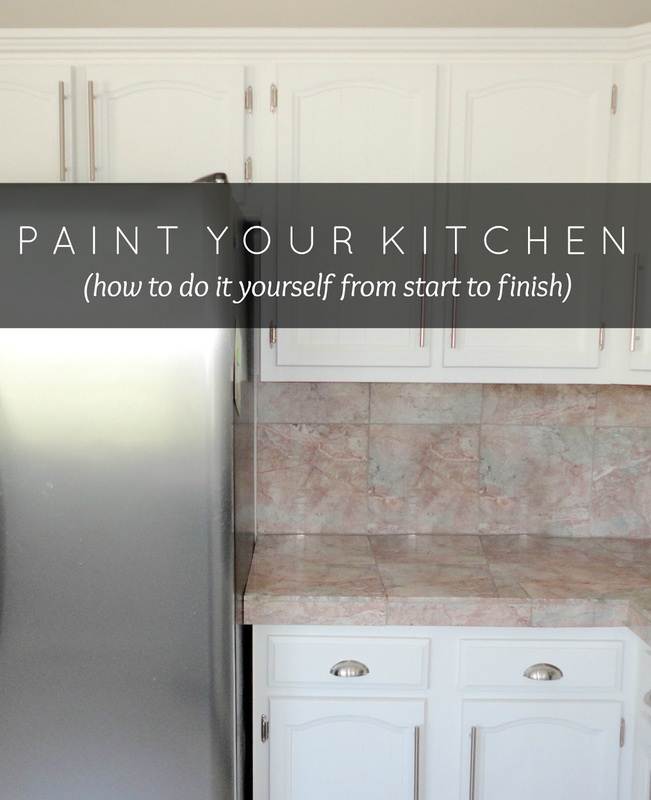 Basically, painting your kitchen cabinets isn't really that hard. It takes some time and effort, but the process is actually rather simple. That's supposed to be a smile. Feel free to ask any questions in the comment section below. I'll try to answer them as best I can!